Passkey for Blu-ray is the most easy-to-use software to let you watch any Blu-ray freely on region specific BD player or player software by removing all known Blu-ray protections. And you can also use other compatible software to deal with unprotected content with the help of Passkey for Blu-ray. 1. 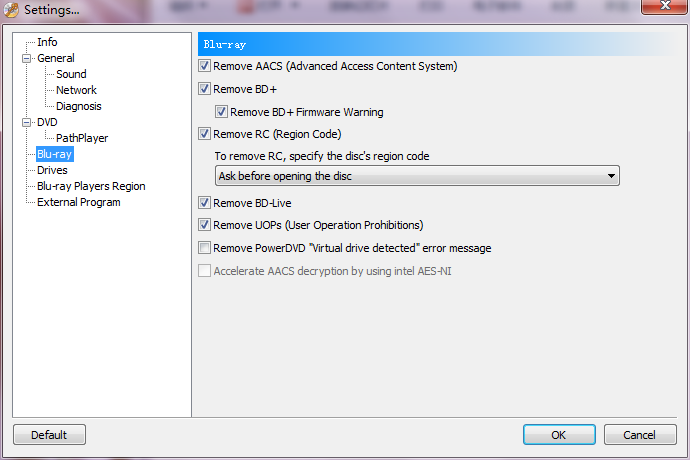 Passkey for Blu-ray can remove all known AACS and BD+ copy protections, Region Code, BD-Live, UOPs, MKB V25, and newest 10th Generation BD+ for Blu-ray and support for new Java-based protechtion . 2. It has the ability to let you change region setting of popular Blu-ray players with a single click. It makes your playback software essentially “region free” or more accurately “multi-region”. 3. Passkey for Blu-ray lets you enjoy any Blu-ray without HDCP-compliant graphics card and without HDCP-compliant display. 5. Passkey for Blu-ray can enable Blu-ray 3D-only disc to be played on 2D display. 6. It has been proved with bunch of verifications that its install package size, physical memory, and GDI are the smallest among all popular products active in this area. 7. Passkey for Blu-ray supports constant updating to help users manage new Blu-ray protections, to offer better user-experience with more improvements and problems/bugs fixed. 8. You can let Passkey for Blu-ray check for new edition automatically; and you can also define the interface language from multiple available ones. Really convenient! Software Author: Fengtao Software Inc.